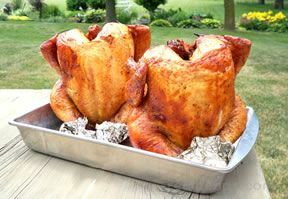 Rotisserie cooking is a great method to use for preparing chicken. The chicken will have a reduced fat content because the fat drains off and it will not be sitting in the fat as it cooks. 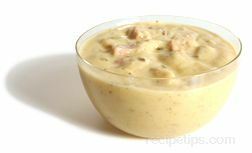 The fat will flavor and moisten the meat as it cooks and drips from the chicken. 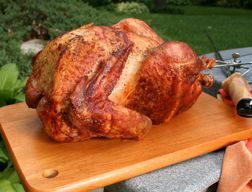 The result of rotisserie cooking a chicken is moist flavorful meat with a nicely browned, crispy skin. The information below provides basic instructions on grilling rotisserie chicken. Preparing a chicken for the rotisserie is not much different than preparing it for roasting. Be sure to select a chicken that will be an appropriate size for the rotisserie unit you are using. If a frozen chicken is purchase, be sure it is completely thawed before you start to cook it. Follow the simple instructions below on preparing the chicken. Generally, a whole chicken will contain a giblet package that needs to be removed from its cavity, unless it was previously removed during thawing. Pat the chicken dry using a paper towel. It is now ready to be seasoned or prepared in the desired manner for rotisserie cooking. The rotisserie chicken can be cooked without any extra flavoring added if desired and you will still have a delicious chicken after it has been basted by its own fats and juices. 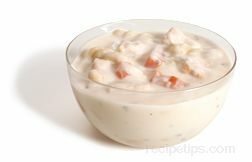 But, adding different flavorings will enhance the flavor of the chicken to your desired taste. 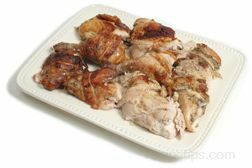 The chicken can be flavored with the use of marinades and rubs or by basting it while it is being cooked on the rotisserie. There are an endless number of recipes for marinades, rubs, and bastes that will provide great flavor and juiciness to your chicken. Don't be afraid to try a mixture of your own favorite flavorings. There are many choices of flavorings that can be used, such as fruits, vegetables, herbs, and spices. Butter and olive oil can also be used to flavor and moisten the chicken as it cooks. Provided below is just one example of a number of flavorings that can be used to enhance the flavor of the rotisserie chicken. Grate the zest from 1 lemon and mix it with 2 tsp. of salt and the pepper. 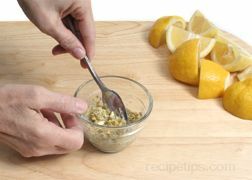 Add the lemon zest mixture to the butter and stir with a fork until the all the ingredients are evenly mixed. Set aside. Salt the cavity of the chicken with the remaining 1 tsp. of salt. 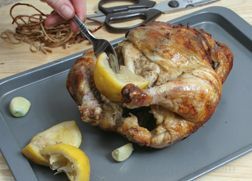 Cut the lemons into quarters and place them in the cavity of the chicken. The number of lemon quarters that are added will depend on the size of the chicken. Add enough to fill the cavity but do not over stuff. When the legs are tied together they need to be able to hold the stuffed ingredients in the cavity. Peel the cloves of garlic and place 5 of them in the cavity of the chicken along with the lemons. Place the chicken on the rotisserie spit as shown below. Once the chicken has been placed on the rotisserie spit and has been secured, be sure the legs are tied tightly together so that the ingredients inside will not drop out when the chicken is rotating on the rotisserie. Apply the lemon and butter mixture to the chicken. Rub approximately 1/2 of the butter under the skin of the chicken, spreading it out evenly. After rubbing the butter under the skin, place the remaining 5 garlic cloves sporadically under the skin. If the outside of the chicken is moist, dry it off with a paper towel and then rub the remaining lemon butter mixture on the chicken. Now finish tying the chicken around the fatty parts of the legs and tying the wings to the body. See below. The chicken is then ready to start the rotisserie cooking. The chicken needs to be placed on the spit so that it is centered and evenly balanced. It must also be held in place so it does not move around as it is cooking. If the chicken was loose on the spit rod and unbalanced, the heaviest side would always drop to the bottom and the chicken would not turn evenly as it is cooking on the rotisserie. See the instructions below on how to place the chicken on the rotisserie spit. Slide the spit rod in through the neck opening of the chicken and out the bottom end. 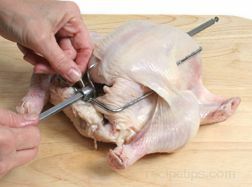 Place the chicken so it is in the center of the rod. 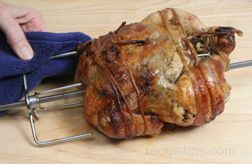 Keep the rod running through the center of the chicken and attach the rotisserie spit forks into the breast end. Once in place, secure the forks on the spit rod by tightening the wing nut. Then attach the spit forks at the tail end in the same manner. When the forks are attached the rod should be centered through the chicken so that it is evenly balanced. It is important for the chicken to be balanced so that it rotates smoothly on the rotisserie unit. Make sure the forks are pushed in so they are holding the chicken securely and that the wing nut on both forks has been tightened. Cut several lengths of kitchen twine and soak in water. 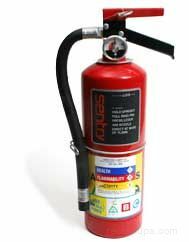 This will help prevent the twine from burning. First loop a piece of twine around the tail, securing it to the rod, unless the tail was secured by one of the tongs of the spit fork. Then cross the legs and wrap the twine up around the legs several times. Tie the twine securely, making sure the opening to the cavity is closed tightly so that the ingredients inside will not drop out as the chicken rotates on the rotisserie. Finish adding rubs or other flavorings to the chicken as shown above and then finish securing the chicken on the rotisserie spit. Wrap another piece of twine around the fatty part of the legs a couple of times and tie securely. Use another piece of twine to wrap around the breast area to hold the wings in close to the body of the chicken. Check to see if the chicken is centered and if it feels balanced by rolling the rod of the spit in the palm of your hand. It should feel like it rolls evenly across it. If not, adjust the forks to even out the weight on the rod. The chicken is now ready to start the rotisserie grilling. 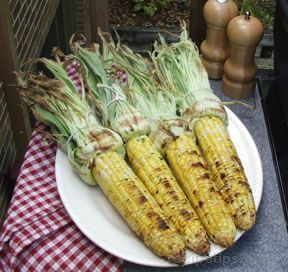 When setting up for rotisserie grilling using a charcoal or gas grill as the heat source, the grills must be preheated before grilling can begin. 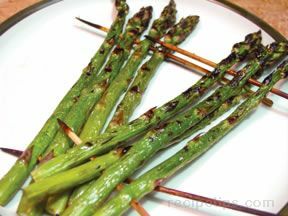 (Refer to Rotisserie Grilling Basics - for details on preheating.) If you have the user's manual for the type of rotisserie unit you are using, be sure to check it for any special instructions. Make sure the chicken is trussed prior to grilling. It may be easiest to truss the bird after it is positioned on the spit. The chicken must be attached securely to the spit assembly (it must not slip on the spit as the rotisserie rotates). The chicken must be balanced properly on the rotisserie. Place the spit in the rotisserie unit. The chicken will rotate as it cooks. This will provide an evenly browned chicken that is very moist. 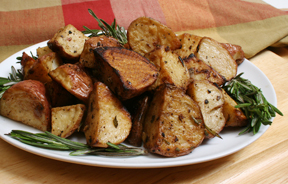 Cook for approximately 15 to 20 minutes per pound. Approximately 15 to 30 minutes before the end of the estimated cooking time start checking for doneness. 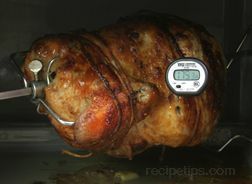 Use an instant read thermometer to check doneness. The internal temperature of the thickest part of the thigh should be 175° to 180° F. If checked in the breast of the chicken it should be 170° to 175° F. If the chicken has not reached this temperature, continue to cook and check in 15 minute intervals until it is at the proper temperature. Remove the chicken from the grill when the internal temperature is 5° below the desired temperature. When the chicken is at the desired temperature, place it on a heat proof surface, such as a cutting board. Remove the forks from both ends of the chicken and take it off the spit. Place it on a platter or a baking sheet with sides. 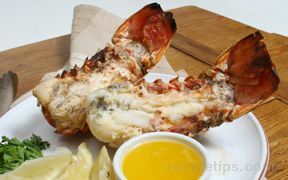 Remove the string from the legs and carefully remove the lemons and garlic from the cavity. 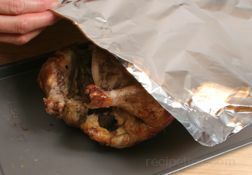 After removing the items in the cavity, tent the chicken with foil and allow it to rest for 15 to 20 minutes before carving. During this time the juices will be redistributed in the meat and the temperature should rise 5° to 10° F, bringing it up to a safe temperature for chicken. A whole rotisserie chicken is carved in the same manner as other whole cooked chickens. 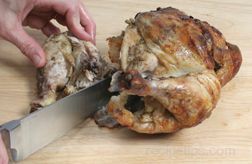 Allowing the chicken to rest as stated above will allow the juices to be redistributed throughout the meat, resulting in a firmer, juicier and easier to carve chicken. Choose a carving knife that is long enough to cut the entire length of the breast. It is important that the knife be extremely sharp so it allows thin slices to be carved and easily cuts through the joints when necessary. 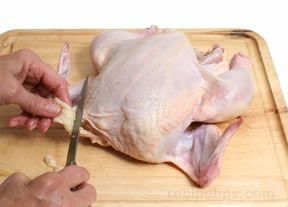 Shown below are the steps to carving a chicken. 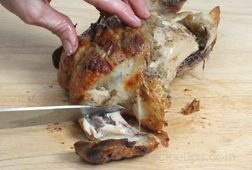 Remove any strings remaining on the chicken that were tied on it to hold it together during the rotisserie cooking process. 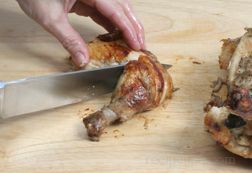 Place the chicken on the cutting board breast side up and begin carving by cutting through the skin and meat between the thigh and breast. 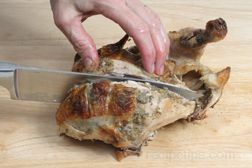 Pry the thigh away from the body and locate the joint connecting the leg to the body; use a carving knife or a large sharp knife to cut through the leg joint, detaching it from the body. On smaller birds, the thigh and leg can be served as one piece or it can be cut into separate pieces. Separate the two by cutting at the joint. Remove the wing by cutting through the joint that attaches the wing to the body, keeping the cut as close to the body as possible. Remove the wing tip, if desired, before serving. 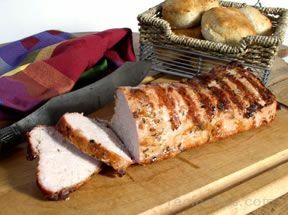 Begin to carve the breast meat by running the knife horizontally under the breast, cutting the entire length of the bird. Make sure to cut all the way in to the bone. Cut the breast vertically starting at the top along the side of the breast bone. 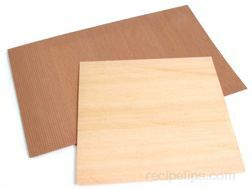 Cut by following vertically down along the breast bone until you reach the bottom where the horizontal cut was made. 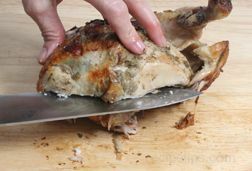 Remove the breast from that side of the chicken and place it on the cutting board to slice. 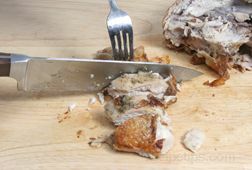 Using a fork to hold the breast in place, slice across the breast, cutting across the grain of the meat to make the slices the desired thickness. 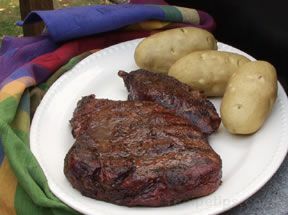 Cutting across the grain shortens the fibers and provides a more tender piece of meat. Repeat the carving process on the opposite side in the same manner. Place all of the pieces on a platter and serve while warm. For more information on chicken, see Meat - Chicken.